“And are there any whales in our Bay?” Meghan asked, rising on her toes to see both rows of students on the M/V Alletta Morris. The boat’s engine was low, and the bow faced into the wind. A young student in the second row raised her hand. It’s been said that we know more about the moon than about the bottom of our ocean. Anyone with a telescope can see the moon, but the ocean floor is sealed in total darkness; its alien features are sometimes otherworldly. This is true even of Narragansett Bay, where the greatest depth is only 184 feet. For the darkness of the water, the depth might as well be twice as great, and even shallow waters can hold surprises, such as traveling dolphins and beluga whales. Such sightings are rare, but the mere mention of these visitors captured the students’ attention as Meghan spoke. They couldn’t wait to retrieve the net and discover what they had caught. Save The Bay’s education programs make Narragansett Bay available to every student in the watershed, many who would be unlikely to visit the coast otherwise, like this group from the Bird School in Walpole, Massachusetts. 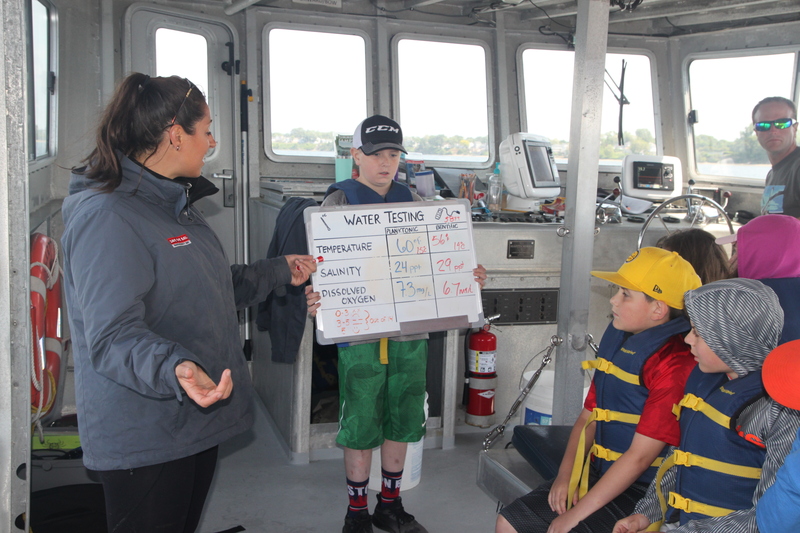 They were participating in Save The Bay’s Explore Your Estuary program, during which students study the Bay in the classroom, on the shoreline and on the water. 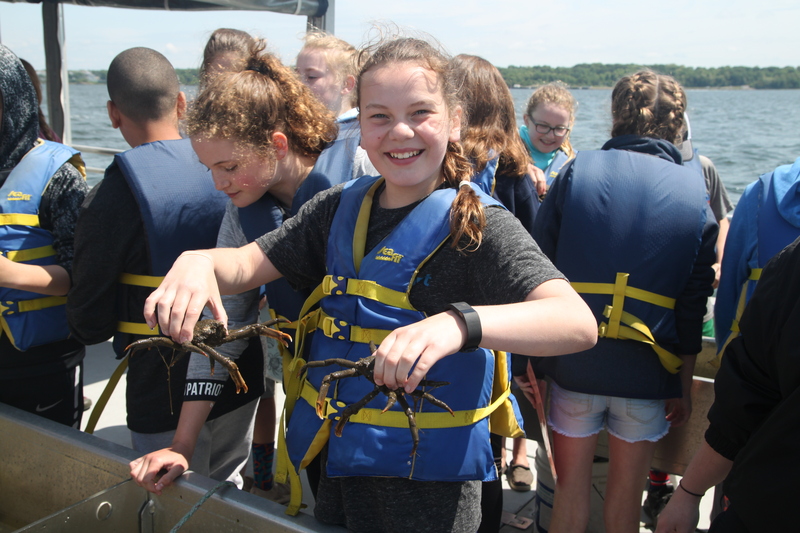 The classroom microscopes were fun, as was the shoreline crab-hunting, but the Bird School students were most excited when traveling out on the Bay aboard Alletta Morris. Their excitement grew when they learned they’d be catching fish with a trawl, but first, they had to conduct a few water tests. Save The Bay educators Meghan Kelly and Jeannine Louro helped the students collect two unique samples. Jeannine chose a volunteer to retrieve some surface water, with just a bucket and short line. A moment later the student presented the catch of green water to his class. Meanwhile, Meghan and her volunteer prepared the special capsule needed to take a sample of bottom water. They lowered their bucket to the bottom, then closed the lid remotely by dropping a “messenger” weight down the line. When they were sure the lid was secure, they hauled in the 60-foot line and presented their sample to the class. There was no green hue of plankton; the bottom water was clear. In fact, besides color, there were a number of differences between the two samples. The surface water was warm and brackish, while the bottom water was cold, salty and dense. The surface water, where the plankton thrived, was rich with oxygen. In contrast, the sample from the bottom, where there were no plankton, had far less. Compared to its shallow counterpart, the deep water was like another substance entirely. The educators explained that while water layers might seem the same to us, to the creatures of the Bay, they mark aquatic regions as different as the regions of the earth, or as the moon and the sea. Once the water tests were complete, all attention returned to the trawl lines at the rear of the boat. 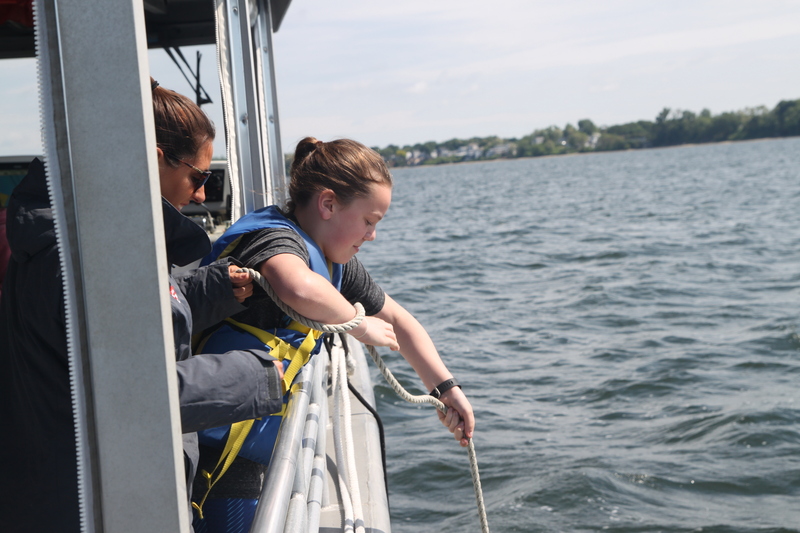 Working together, the team of students hauled the net back to the surface; the boat crew quickly deposited the catch into onboard touch tanks. The yield was impressive, with many snails and hermit crabs, several stony spider crabs, a horseshoe crab and flounder of various sizes. The students set about the tank, handling the crabs and snails and gently petting the flounder along their flanks. Captain Alex Couturier noted that the catch contained at least nine unique animal species, plus many plants and seaweeds. Such a colorful haul is a testament to the biodiversity of the Bay. But the deep trawls and weighted messengers also suggest the fascinating distance of the ocean bottom. The Bird School students bridged that distance with long lines and nets. For an afternoon, they had glimpsed that faraway place at the bottom of the Bay. Bird School is 40 miles from the Bay, and some of these students had likely visited the Bay for the first and last time that year. But Narragansett Bay belongs to them as much as it does to the the dolphins and whales that pop in on the course of longer journeys. If it’s true that our oceans are more obscure than our moon, what an opportunity for our students, to take to the water and discover the Bay firsthand. Their journey is greater than a moonshot.